♥Teaching Fabulous Firsties and 2nd Grade Smarties!♥: International Blog Hopping Day Freebies! International Blog Hopping Day Freebies! Who doesn't love Freebies?!? 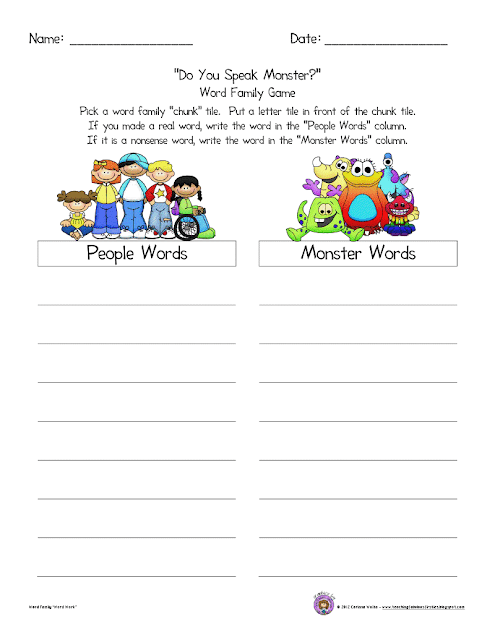 Here is a freebie for you to use during Daily 5 Word Work or as a literacy station. Use the onsets and rimes/word families your kids are practicing by writing them on tiles. Kids get to match the onsets and rimes to make either "People Words" or "Monster Words." I'd love to have you comment on my blog and/or follow me if you found the freebie useful! Thanks! Click HERE for your "Do You Speak Monster?" Freebie! Thank you, Deborah! I'm glad you liked it! Love the freebie! Thank you. I'm your newest follower.